Carnegie Council announces the publication of the first issue in the 30th anniversary volume of its journal, "Ethics & International Affairs," featuring a roundtable on the relationship between Morgenthau and America, an essay on defining national sovereignty through rights and responsibilities, feature articles on revocation of citizenship in democracies and on autonomous weapons, and more. Carnegie Council for Ethics in International Affairs announces the publication of the first issue in the 30th anniversary volume of its distinguished journal, "Ethics & International Affairs." 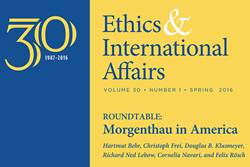 This issue includes an essay by Amitai Etzioni on how to define national sovereignty through rights and responsibilities; a roundtable on the relationship between Hans Morgenthau and America, with contributions by Cornelia Navari, Felix Rösch, Hartmut Behr, Christoph Frei, Richard Ned Lebow, and Douglas B. Klusmeyer; features by Patti Tamara Lenard on revocation of citizenship in democracies and by Robert Sparrow on the case against autonomous weapons; a response by Helen Frowe to Daniel Brunstetter and Megan Braun's article on jus ad vim (EIA 27.1), with a rejoinder by Daniel Brunstetter; and book reviews. The international community should spell out the kinds of failures to protect civilians that can justify armed interventions by other states, and should establish a responsibility to prevent international terrorism. Morgenthau published "Politics Among Nations" in the United States in 1948 with the stated purpose of serving his fellow countrymen. But is it truly an American book? The evidence is mixed. When read next to his "Scientific Man vs. Power Politics," published in 1946, "The Purpose of American Politics" reveals a significant shift in Morgenthau’s intellectual and political orientations. This article assesses the justifications given for the claimed power to revoke citizenship in democratic states and concludes that, ultimately, such a power is incompatible with democracy. The set of principles proposed by Brunstetter and Braun to comprise jus ad vim is redundant, and the project stems from a largely implausible understanding of the principles of jus ad bellum.